We have all seen it. We are at the mall and we see a kid complaining to his parent about not being able to buy something. The kid complains, pouts, and sometimes has a temper tantrum. I know when I was a kid, I complained many times when I didn’t get something I wanted, or didn’t get my way. I even had a few temper tantrums. 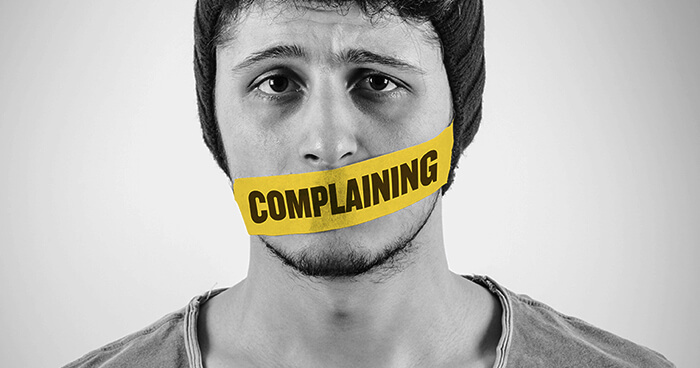 Complaining is not just problem with children, but also adults can fall into that mindset. We complain about our jobs, our financial situation, our car that always seems to break down, our overall lot in life, or any number of other things. The root of our complaint often times is discontentment. We compare ourselves to others; what job they have, what house they have, what car they drive, how many likes they get on Social Media, how their kids are so well behaved and smart, etc. We then feel that we are not where we should be in life, and that’s when we become dissatisfied and complain. God said many things in the Bible about complaining and being content. Here are just a few to reflect on. As parents, we are a model for our children to follow. Whether our children are 2 years old or 25, they are always watching how we react and behave. Our children must learn from us how to be content, and how not to have a complaining spirit. If we model it correctly, they will follow suite. We are not perfect, so we are going to mess up from time to time. When we do, we just need to acknowledge it to God and our children; asking their forgiveness. Around Christmas time, complaining can happen when we receive gifts. Maybe we didn’t get what we wanted and/or asked for. Maybe it was the wrong color or size. Maybe your spouse spent too much money. Whatever it is, lets make sure as parents we are modeling the behavior we would want from our children during the holidays. Posted in Parenting Toward the 30%. Ken has also serves on the board of another non-profit called DFW HDI, which is a membership organization of IT support professionals. And Ken is the Director of Enterprise Data Management at IHS Markit, which is a multi-Billion global financial services and software company. Ken, and his wife Karen, have been married for 26 years, and have a 25 year old son. They live in McKinney, TX, just North of Dallas. As Ken and Karen repeatedly witnessed many Christian students who were active within the Church walk away from their faith shortly after graduating high school, they grew frustrated. Studies show that about 70% of young adults leave their faith after graduation, which is a huge issue since they are the future of the Church. After much prayer and searching God's direction for many years, the Leaman's felt His calling to start a ministry to address this problem. In 2014, they gathered like minded Christian professionals to help begin Young Adults of Worth Ministries. We believe that this ministry is from God, and it will be blessed by Him for His glory alone. Studies have shown that 70% of young adults raised in Christian homes walk away from their faith shortly after graduating from high school. We are encouraging and equipping parents to intentionally train their children to be part of the 30% who continue to grow in their relationship with Jesus Christ and walk with Him.